Journalist Robert Carmichael, author of When Clouds Fell from the Sky, didn’t think he’d spend eight of the last 14 years in Cambodia, where he has worked covering political ructions, postwar reconstruction and the Khmer Rouge Tribunal for a wider, international audience. But the South African’s fascination with how war-torn countries deal with the ghosts of their past and the lure of a country that still lives up to its reputation as an exotic Southeast Asian destination helped sustain Carmichael’s curiosity, resulting in his first book. “I’m interested in what post-atrocity nations do to move beyond their past. That question forms one trajectory of my book. Cambodia, for instance, opted for a judicial process but has done little to bring about reconciliation,” the 45-year-old said. The book delivers the tragic tale of a French mother and daughter and their search for Ouk Ket – their husband and father — who vanished almost immediately after returning to Pol Pot’s Cambodia in 1977 — and a Cold War history lesson that’s worth re-telling, particularly to younger audiences. It’s also timely given upcoming commemorations in April marking the 40th anniversary of the Khmer Rouge takeover of Cambodia, and the unfolding drama at the Khmer Rouge Tribunal where charges of genocide are being heard against senior cadres Nuon Chea and Khieu Samphan and fresh charges have been laid against lower ranking cadre. Carmichael writes intelligently about a complicated subject that continues to haunt the survivors, be they Cambodians or anybody else from the myriad of foreign powers that dabbled in this country’s tragic history at their peril. The Diplomat’s Southeast Asia correspondent Luke Hunt recently spoke with Carmichael. How did you happen across Martine and Neary and their story? Entirely by accident. I met them at breakfast at a riverside restaurant in Phnom Penh in early 2009. 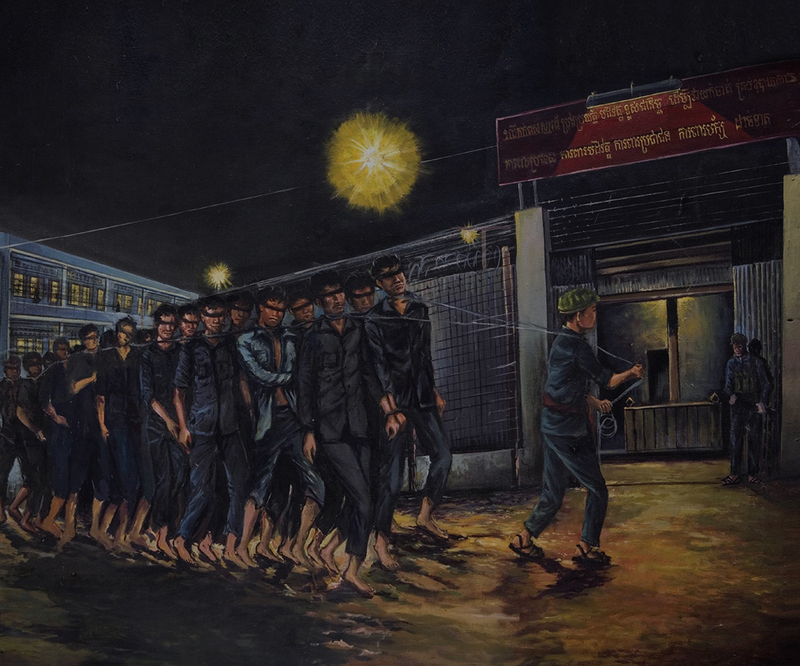 I’d returned to cover the first trial of a Khmer Rouge cadre – that of Comrade Duch, Pol Pot’s security chief, who ran the S-21 torture and execution center. Martine and Neary had come from France to see the start of the Duch’s trial because Ket had been held at S-21 for six months in 1977. Their story of disappearance and loss is common to many Cambodians; I thought recounting what had happened to them and to Ket’s Cambodian family could serve as an unusual way to tell the broader story of the Khmer Rouge’s 1975-79 rule. Duch’s trial provided a way to bookend Cambodia’s previous five decades and to look at what impact a tribunal, one form of post-atrocity reckoning, can have. How do you rate the Khmer Rouge Tribunal to date? The tribunal’s a hybrid court – part UN, part Cambodian – and in some ways it’s proven a bold experiment because it established a tribunal inside the country where the crimes took place. That sets it apart from better-known international courts such as Rwanda and the former Yugoslavia. Its structure and location has benefits and disadvantages. Among the former: Hearings are conducted in the local language and the public is able to attend. Among the disadvantages: In Cambodia’s case there have been widespread allegations of corruption and political interference. The corruption doesn’t surprise me since this is one of the world’s most graft-ridden nations. The political interference doesn’t either, but for different reasons: Post-atrocity processes, whether tribunals or truth and reconciliation commissions, are inherently political because they are considering crimes that are by their nature steeped in politics. So politics is seldom far from their genesis or their functioning, and we certainly saw that with this tribunal. The short answer is that it has a mixed record. It’s handed down three convictions (two of which are on appeal), and shone more light on the 1975-79 rule of Pol Pot’s Khmer Rouge. Less impressively it took years to establish and has operated very slowly; that’s particularly egregious given the age of the defendants and many witnesses. Some journalists and photographers have testified at the tribunal and there are those who refused? As a witness to the atrocities committed by the Khmer Rouge, were these correspondents morally obliged to testify? That’s an interesting question because journalists aren’t meant to be the story. We simply report to inform the public. In short, I don’t believe there’s a moral obligation for journalists to testify at such hearings but I can understand why some might want to. The defense has been accused of deliberately delaying proceedings at the tribunal irritating the many observers who are fed up with constant delays and are painfully aware that Nuon Chea and Khieu Samphan are in their advanced years. Is this criticism fair? Well the job of the defense is to represent their client to the best of their ability, and while it’s true that some defense teams have irked the judges, it’s true too that they are operating under the rules of the court and are quite entitled to push the boundaries. That said, I understand how that angers many people; it can certainly seem unjust. I’d also say this: While adding weeks to the proceedings by filing defense motions certainly drags things out, the bigger issue is why these cases took so long to come to trial in the first place. For that, look to the international community and the Cambodian government. It took a decade from signing the agreement before the trial of the four surviving leaders started. And the negotiations to get to that signing ceremony took years themselves. Australian author Sebastian Strangio wrote in Hun Sen’s Cambodia that this country’s few success stories – particularly democracy and elections – were a mirage, because of the enormous influence corruption has had on political life. Is the Khmer Rouge Tribunal a mirage? No. It’s had tangible benefits – some indirect, others direct. With the former I’d cite the new school syllabus about the Khmer Rouge period. A decade ago, pupils learned just a few lines; now they have a well-researched 100-page book. Although the tribunal had nothing to do with that directly, it’s hard to believe this textbook would have appeared had it not been in existence. As for intangible, I like what Cambodian filmmaker Rithy Panh said: For years the Khmer Rouge’s many victims were practically unknown, but that now people like Ket are remembered. Given the Khmer Rouge’s nihilist approach, that has profound resonance. You make a point of comparing post-apartheid South Africa’s reckonings with those in Cambodia. Are such comparisons worthy given the enormous differences in culture and in the historical paths that delivered them to where they are now? Yes, and not least because it’s intriguing to see how different nations deal with these significant parts of their histories. It’s impossible to draw direct comparisons, of course, but each has something to teach us. You bring to life senior people who worked within the Khmer Rouge, like Chan Youran, a senior diplomat whose subservient involvement could have led to the deaths of many. Do you believe people at his level should have been investigated by the tribunal for possible criminal charges? Chan Youran is an interesting character, though it’s impossible to know whether his involvement led to anyone’s death. He was Ket’s boss when the two worked at the Cambodian embassy in Senegal in the 1970s. Chan Youran returned to Cambodia during the Khmer Rouge’s rule. He wasn’t a complete nobody in the Foreign Ministry during the Khmer Rouge period, but it’s unlikely he was making life-and-death decisions either. Part of the problem with any mechanism dealing with mass crimes is where you draw the line of culpability. The more people you investigate, the more it costs in terms of time and money. Inevitably many people will get away with murder and other abhorrent crimes. Where and how is Neary and her mother Martine now? They’re back in France and getting on with their lives. Ket’s disappearance consumed them for decades and I suppose always will. They were glad to be able to testify at the tribunal and to see Duch eventually jailed for life. That said, it’s clear that people never get over this sort of thing, and they’ll surely remain burdened with what happened to him. Just like millions of Cambodians they’ve resumed living their lives, difficult though that has been. That really is a testament to human resilience. When Clouds Fell from the Sky will be published by Asia Horizons Books on March 31, 2015.